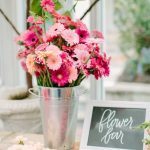 Hosting a bridal shower doesn’t have to be overwhelming: with a few simple tips and tricks, you can totally do this! So take a deep breath, and read on for some of my favorite shortcuts for creating a beautiful shower that you’ll actually get to enjoy! Planning a bridal shower is a HUGE undertaking—and one you shouldn’t face alone! No one could possibly orchestrate the invitations, food, decorations, and cleanup solo while remaining sane. So, find a team and delegate responsibilities, and be as specific as possible. Recruit two or three bridesmaids to organize a fun shower game and prize; another could set up the mimosa bar or a similar “station;” and if anyone has a special talent for flower arranging or crafts, ask them to help with décor! Once you have a date and location, you’re ready to create the invitation! Make this step super simple by skipping a long list of where the bride is registered; instead, simply state: “Visit registryfinder.com to find [bride’s name]’s registry.” You can see a sample invitation I created above—so simple and streamlined. This step will save you from having to keep up with everywhere the bride has set up a registry, and make finding those registries really simple for your guests! This tip might not seem like a shortcut at first, but it will save you (and the bride) time in the long run! I’ve used this system for every shower/birthday party/event I’ve hosted, and it’s incredibly helpful for tracking RSVP’s and writing thank-you notes. Start by downloading this Microsoft Word template, and fill in your guests’ names and addresses in the first column in alphabetical order. As guests begin to RSVP, record the number attending in the second column (that way, you’ll have all the RSVP’s neatly organized instead of jotting down “yes’s” and “no’s” randomly). Next, print out the list and bring it to the shower (optional: delete any guests not attending the shower before you print). As the bride opens gifts, use the third column in the template to record each gift she receives. No more scrambling to figure out who Aunt Sally is or spell the bride’s coworker’s name correctly, plus the alphabetized list makes names easy to find. Finally, hand over the completed document to the lucky bride: now she has names, addresses, and gifts all organized to make thank-you note writing a breeze! You don’t want to spend the entire shower in the kitchen, so prep as much of the food as possible beforehand! We’ve got you covered with make-ahead menus for any kind of shower! 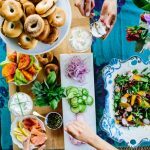 Check out our Easy Brunch Menu if you’re hosting a morning event: every recipe can be made in advance, and just assembled the morning of the shower. Food Bars are another creative menu idea that’s simple to prep, since your guests do all the work of assembling their plates! A Dessert Tasting is another unique shower idea that allows you to do all the prep work before the shower begins! 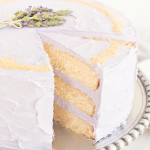 You don’t have to spend hundreds of dollars on a fancy cake to create a gorgeous dessert. Let the natural beauty of fresh flowers adorn your cake and make a statement! In the example above, my sister-in-law Jenny made a simple white cake with buttercream frosting, and used gorgeous roses and carnations to create a stunning topper. Low cost and super effective! How adorable are those centerpieces using kitchen items? Before you buy new vases or décor pieces, look around your house for inspiration! You’ll be amazed at how you can utilize items you already own! Try throwing a shower around an existing holiday: your house is already decorated (or you already have seasonal décor items), and you can use the colors and flavors of the season to influence your décor and menu. We’ve rounded up a few of our favorite seasonal ideas here, with tons of inspiration. Check out our posts on showers for Spring, Fall, Christmas, and Valentine’s Day! Think of ways one item can serve multiple functions. My favorite example: use place cards as centerpieces AND party favors! My friend Carly did this beautifully using succulents: look at how adorable they are, and how they dressed up the table! Here’s another fun example: once again, I’ve got to showcase my sister-in-law, who is clearly a bridal shower pro. She was inspired by this marble invitation, and picked up samples from a tile store to create these adorable place cards. Each guest took hers home to use as a pretty paperweight! 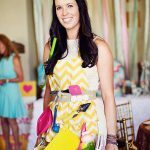 Hopefully, these hacks have made hosting a bridal shower seem a little less daunting and a lot more fun! Be sure to check our blog archive for many more shower tips and tricks, and remember that registryfinder.com is always your “hack” to finding your friends’ registries for any occasion! -written by Christina Peterson, who is determined to find hacks for all of life’s tasks.